Please look at the below map of the school campus. 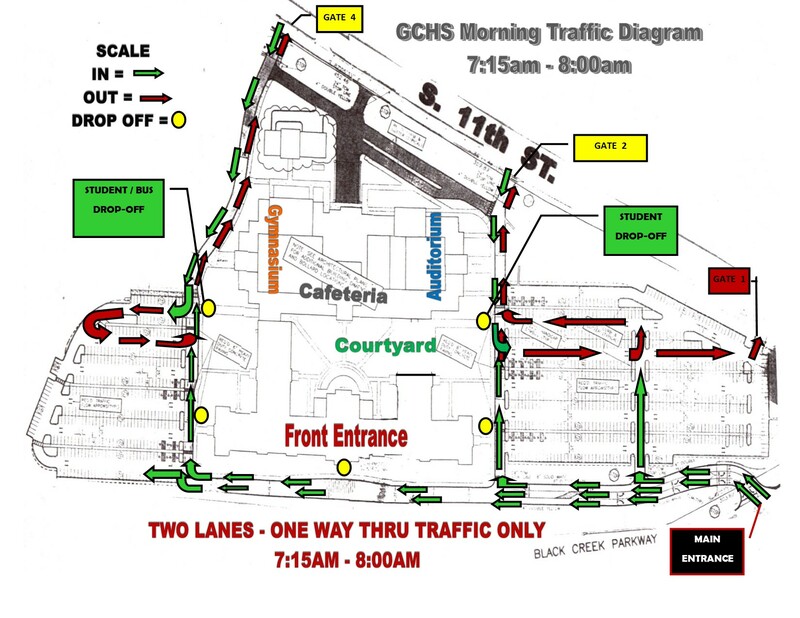 Beginning on Wednesday, October 17, we will be implementing this NEW traffic flow plan for morning drop-off traffic. There are five (5) points of drop-off marked in YELLOW. One at the courtyard area, one at the East B hall entrance, one at the front entrance, one at the West A hall entrance and one beside the gym that goes into the Commons area. ENTRANCE FROM MAIN GATE: The front main gate off of Black Creek Parkway will be an ENTRANCE ONLY with 2 lanes of traffic flowing at the same time. The right lane will be for traffic that is going to drop-off at the East “B” Hall door, the courtyard OR to park in the front parking lot. The 2 left lanes will be used for through traffic to proceed in front of the building for drop-off and around to the drop-offs at West A hall entrance and the gym side (Commons Area Entrance) of the school. The EXITS will be through Gate 1 at the far corner of the front parking lot that will exit out to South 11th Street or you can exit out of the gate at the Auditorium (Gate 2). If you have proceeded around to the gym side of the school, you will continue to exit through Gate 4 to South 11th Street. ENTRANCE FROM GATE 2 : You may enter through Gate 2 (Auditorium) from South 11th Street and continue forward to the drop-off at the courtyard and will then make a left turn through the parking lot and will circle back around to exit out of the same gate or continue through the parking lot and exit campus out of Gate 1 in the far corner of the lot.